Leviton SmartlockPro® Self-Test GFCI devices, introduced in 2015, feature a small LED status indicator light to give you a convenient way to check the level of ground fault protection at-a-glance. GREEN LIGHT indicates the device has passed the self-test and is providing power. RED means the device needs attention. Your SmartlockPro Self-Test GFCI is engineered to regularly conduct an internal test (self-test) to confirm that protected power is available, offering an added layer of protection from electrical shocks due to hazardous ground-faults. If, during a self-test, the GFCI detects a potential problem, one indicator is a solid or blinking red light. In this case, simply press the TEST and RESET buttons to reset the GFCI. If the device resets, you’re good to go. If the GFCI will NOT reset or the solid or blinking red light continues, the device has somehow been compromised and must be replaced. NO LED means the device is in the tripped state. This can be due to a few reasons. • A ground fault has been detected and power was automatically cut to help protect you from the potential occurrence of shock or electrocution. In this situation, simply press the RESET button. If the device resets you’re good to go. If it does not, there is still no power on the circuit and for safety reasons the device must be replaced. • The circuit breaker tripped or there is no power to the circuit and the device cannot be reset. • The self-test functionality has been lost and the device will therefore not reset. The unit should be replaced. The graphic below is a snapshot of the LED Indicator Lights. 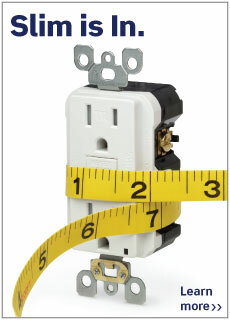 Remember, GFCIs are used to help protect you and your family from the risks of electrical shock. If there is any indication that protection has been compromised it is important to replace the device.